An overview of northern Garund's perilous desert nation, including alchemy-fueled Thuvia, godless Rahadoum, and treasure-laden Osirion. 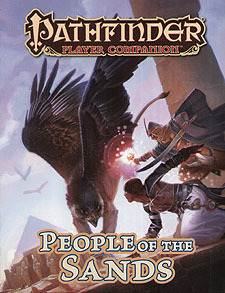 Detailed examinations of the people who populate Golarion's harsh deserts, inclding the silver-tongued Keleshites, the enigmatic Pahmet, and the proud Garundi. New feats and spells to steep characters in the desert's rich history, as well as two new prestige classes iconic to these harsh realms. Campaign traits perfectly suited for characters tasking part in the Mummy's Mask Adventure Path. New rules options for characters drawn to the desert, inculding a new oracle archetype, a new sorcerer bloodline, a new cavalier order, and more.